“It’s larger than you might expect in a townhome, and we love that the laundry room is in a closet in the master bedroom. I like the modern feel, the size of the great room and how the kitchen spills over into the rest of the ouse,” Glenn said. 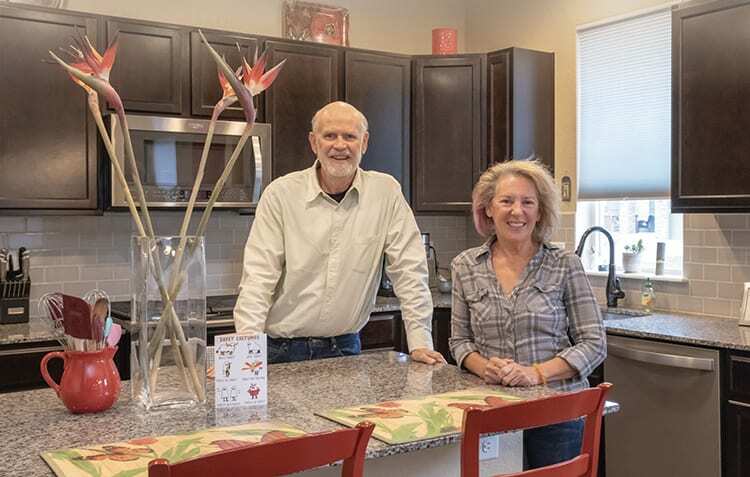 “We never have to go upstairs.” Rita and Glenn opted for a ranch-style townhome, and dedicate the upstairs bedroom, full bath and sitting area for their many guests. “Brennan by the Lake is a great location in Erie. It’s perfectly located a few minutes from I-25 with easy access to Boulder.” Davidson said. “You get to share in the charm of Erie as well as the many nearby communities with that small-town feel.” Erie has been named among “Best Places to Live in America” by Money Magazine and boasts outstanding views and unbeatable weather. The Thompson Reservoir, Glenn’s favorite place for dog alking, is stocked with rainbow trout and features walking trails, picnic areas and wildlife viewing. 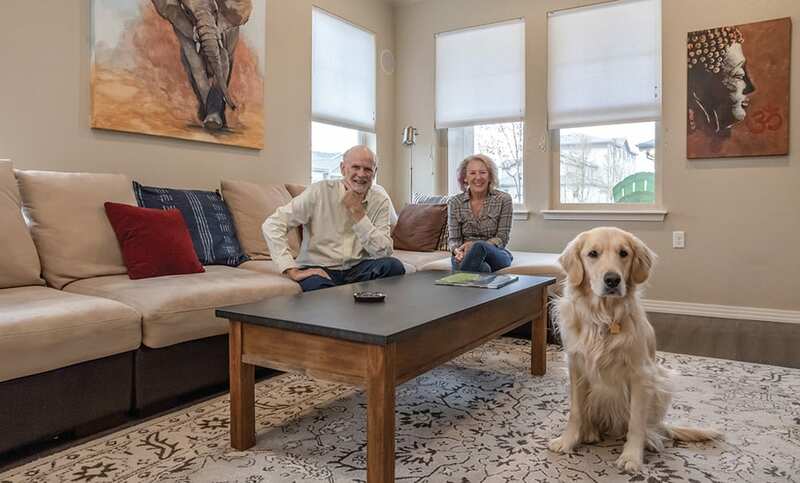 “Moving to a Boulder Creek home has been freeing,” Rita said. “We were able to get rid of excess and live simply.” Glenn said, “Being able to travel without worrying about landscaping is also freeing. 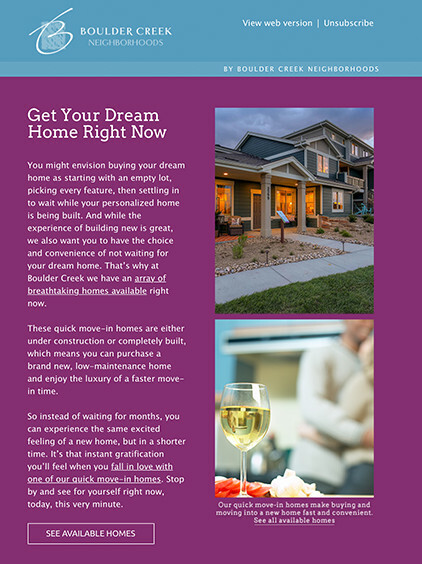 We want to spend our days traveling, making memories.” Boulder Creek Neighborhood’s commitment to vivacious, meaningful living extends to the way home buyers will interact with their new homes. Low-maintenance homes at Brennan include top Energy Star-rated appliances and high-efficiency furnaces. 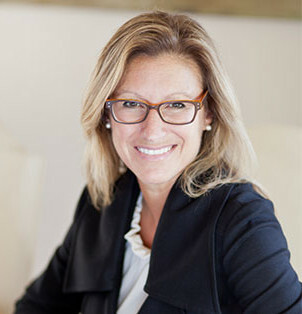 After all, “durability and efficiency contribute to a low-maintenance lifestyle by reducing the likelihood of expensive home maintenance and repair projects,” said Davidson, with a nod to resource efficiency and monthly energy bills. “This frees up time and resources to spend on other activities, such as friends and family, hobbies and travel” and reduces stress about the home.